Last Saturday’s workshop was a privilege. After a gruelling week with not such brilliant sleep (during the week) I thought I might be running on empty by Saturday afternoon. However I did sleep reasonably well the night before. On the day, it was cloudy with breaks of sunshine and a peculiar curving wind. I was calmly excited with anticipation for the workshop. In terms of numbers it was modest and this did allow for more in-depth interaction and openness amongst the participants. The group was bold, generous and authentic, in fact even nurturing towards each other. My beloved Abhi participated too on this occasion, which was very useful in receiving a no holds barred critique afterwards. His comments were wholly positive. We’ve had dinner. Eastenders is on in the background. Half-heartedly we’re watching. I had planned it this way, as you were away, so that I had mum to myself. In theory, the plan was to tell her, and then you. She thought I was joking…that it was an excuse not to get married. Apparently she was clueless. But what about mums knowing their sons and all that? What about the Gay Times incident at 16…? Arena workshop participant – 22 June 2013. Do you have a turning point to share? Workshop exploring British Asian lesbian, gay and bisexual lives: Sat 22 June, 2pm, Arena Theatre, Wolverhampton. Here’s the 1 min 11 edit on the Sunrise website. And just to clarify, we’re using the real life interviews as ‘inspiration’ – a starting point. We’re not making verbatim theatre through the retelling of specific lives. And what’s just sliced from the end of the interview is: whilst this project isn’t trying to change the world, it is about breathing life into this much hidden subject in Asian communities (to raise more awareness, discussion and understanding). Sunrise Radio interview to air today every hour this morning just after the hour. This is their LGB/T coverage week. Listen live online or access in archives from tomorrow. 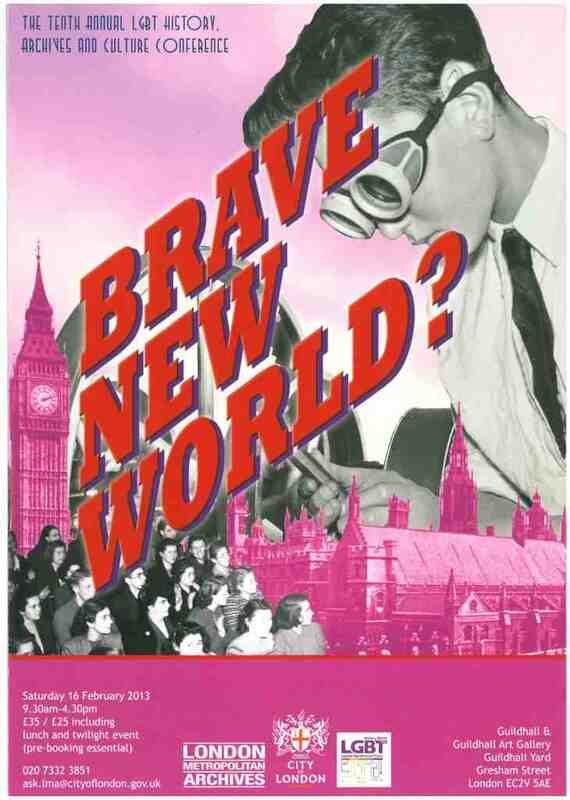 I’m looking forward to attending Brave New World tomorrow. It looks like an interesting line up. It will be great to hear about other LGBT projects currently taking place. It will also be useful to make some new links with the heritage sector. Whilst the theatre production is the initial priority, I’m also looking to maximise the learning, training and archive potential of the material gathered; and to appropriately celebrate and profile the lives of the respondents more directly.